Hello. I've just received my order for compatible Photosmart C4485 inks. My HP Photosmart C4485 printer isn't listed on the packaging of the cartridges that I've been sent. Will they still be okay or will they need to be returned? I look forward to hearing from you, Paul Myers. We can confirm that the compatible HP 350 and HP 351 ink cartridges you've ordered are the correct cartridges for use in your HP Photosmart C4485 printer. The list of printers on the box isn't an exhaustive list so we'd ask you to check the compatibility of ink cartridges on our website to see the full list. Why can't I get inks for the HP C4485 Photosmart printer in Tanzania? I'm afraid that we can only supply ink for a HP Photosmart C4485 printer that was purchased in the UK and we only deliver within the United Kingdom. Please contact HP directly and they should be able to advise you of a supplier of HP C4485 ink in your region. I have an HP Photosmart C4485 printer and need some black ink cartridges for this machine. At present, I have a cartridge number 350XL in the machine. What should I order from you? We offer a choice of black ink cartridges for the Photosmart C4485 which include the genuine HP 350XL high capacity ink cartridge or the standard capacity HP 350 black ink cartridge. You can also buy the HP 350XL ink as a compatible cartridge. To view these items please return towards the top of this page. You quote that a cartridge will print x pages at 5%. What does 5% mean in characters on a page? Specifically how many Times New Roman 10pt unbolded characters = 5% ink? This parameter seems only to allow you to use the figure as a comparison between different cartridges. I recently purchased a HP 350 ink cartridge for Â£6.71. My print outs comprised 157 lines with a total of 4,600 characters of Times New Roman 10 and 12 pt and the ink ran out after 50 pages (13p per sheet). So that amount of characters must be about 20% ink on the sheet? Is it possible for me to use two black cartridges rather than one black and one colour? Unfortunately, you are not able to install two black cartridges within your HP Photosmart C4485 printer at the same time. You will need to use one colour and one black at all times. Hi, I have the HP Photosmart C4485 scanner and printer which I bought in Ireland. I have now moved to Mozambique and cannot buy the cartridges for this machine? Are ink cartridges allowed on international flights as my brother is coming out from the UK and I want him to bring me some? Unfortunately, as your printer was purchased in Ireland it will be very difficult to obtain the correct cartridges in Mozambique. This is because ink cartridges, similar to DVDs, have region codes depending on where the printer was purchased. Ink cartridges are allowed on international flights. The HP Photosmart C4485 is yet another example of the Photosmart range from Hewlett-Packard. However, when there are so many options to sift through, even in a single range of printers, it can be a challenge figuring out what benefits one printer might have over another. Well, the HP Photosmart C4485 might have gone a little unnoticed of late, but in order to ensure that you pick the best choice for your needs, you'll need all the facts; hence this brief review of the HP Photosmart C4485 and its features. There is very little to tell you about the design of the HP Photosmart C4485. 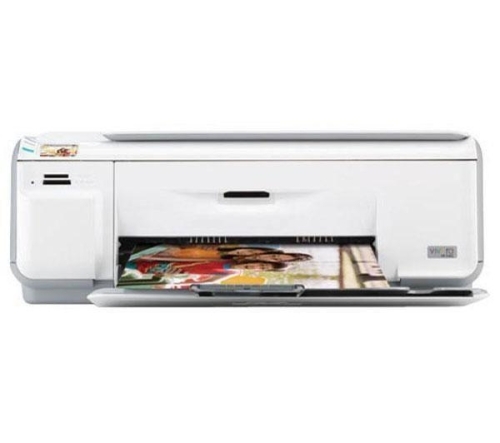 In simple terms, this printer fits pretty much entirely with the many Photosmart printers as it boasts the same white finish and soft curves which have rendered this range so desirable. Technically speaking, the user interface is very wisely positioned on the left of the printer, allowing for easy use. The HP Photosmart C4485 is by no means Hewlett-Packard reinventing the wheel, but it does boast many key features which help to give it its own personality. The HP Photosmart C4485 offers high quality print-outs, a scanner function which is smartly disguised by the liftable lid and Bluetooth capabilities are also present. There are none to speak of really, unless you are looking for a printer which also makes you your breakfast. Yes, the HP Photosmart C4485 is another fine example of just how effective a Photosmart printer from Hewlett-Packard can actually be.